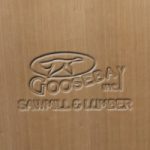 Cherry Plywood - Goosebay Sawmill and Lumber, Inc. This is cherry -veneered plywood. It is suitable for interior cabinetry applications. Sheet size is 4 feet by 8 feet. The appearance is plain-slice (the veneers are cut from the log in slices and laminated to have the appearance of boards). The core is veneer, which is structurally stronger than an MDF, or particle board, core. We are able to order cherry plywood with an MDF core. Although it has less structural strength than a veneer core, it is deemed by some to lie flatter. Pre-finishing, 3/8 inch thickness, and an A1 grade for the 1/4 inch thickness are available.